My oldest daughter liked my Valentine socks so well, she requested a pair. She really wanted me to use the variegated yarn, but I couldn't find any more. I was able to use a small about in the ribbing at the top. 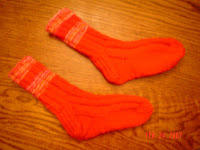 The rest of the sock is solid red. This is again Bernat Softee Chunky. We live in a rural area, so there aren't any stores that just sell yarn too close to me. I have found some of the Encore yarn at a quilt shop about 30 miles from me. I stop in there when I work in the area. The last time I was there, the yarn was on sale. The owner isn't sure she is going to carry it any more -- how sad! I do like the Encore yarn -- it is soft and works up nice.